HBO Boxing and Top Rank Promotions will be televising a boxing event from the Venetian Macao (in China) on HBO2 on Saturday, July 19, 2014 at 5PM Eastern Time. The main event will be Guillermo Rigondeaux vs Sod Looknongyantoy for the WBA/WBO super bantamweight titles. Everyone who knows anything about pro boxing knows that the fans at the Cotai arena will be there to cheer on their countryman, Zou Shiming, in the co-main event when he faces Luis De La Rosa in a 10 round contest. Althouh Shiming is only 4-0, 1 KO in his pro boxing career, he has come a long way under the tutelage of Manny Pacquiao’s trainer, Freddie Roach. Without a doubt, Roach is the greatest trainer in all of boxing at the moment and maybe one of the greatest of all time. Since Top Rank president, Bob Arum, is very high on Freddie, he is equally high on Shiming. 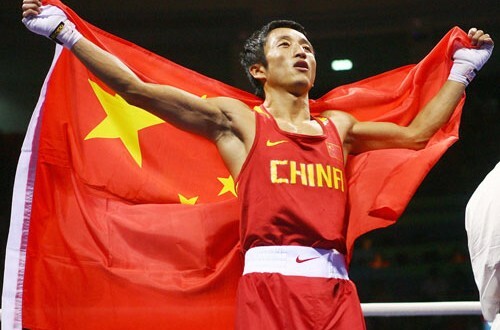 The Chinese Olympian is Top Rank’s ticket to making professional boxing a popular sport in China. Zou has become a superstar since turning pro in April 2013. He has had four fights in a span of one year. That’s an extraordinary feat for any boxer. Each boxing event reveals Shiming’s skillset evolving quickly and that has lead to huge ticket sales and country-wide interest in China. And with all of the interest and intrigue coming from the land of one billion plus, Top Rank will be cashing in big on Shiming’s notoriety. The Olympic medal holder just has to keep evolving and making a name for himself in his weight division. Being 33 years old just means that he’s got to stay on the fast track to prize fighting. For those who are wondering if Zou Shiming is being paid accordingly since he brings in the Chinese audience, he was paid $500,000 for his last fight. That is an extraordinary amount for a fighter who has had so few fights. Although he isn’t making the type of money that Manny Pacquiao and Floyd Mayweather are, he is doing far better financially than any other boxer with just four fights under his belt. Should Zou Shiming defeat his opponent as expected on this boxing event at the Venetian, Macao, then my guess is that he will continue to be booked in the same venue every four months until he reaches his tenth pro fight. At that point, he will hopefully still be undefeated and he will most likely be in a position to command at least doubt the amount of money that he is currently making. But as in all combat sports, it’s a bad idea to look too far into the future. So let’s see how Shiming does against Luis De La Rosa before we rush to judgement. Although this event is not considered a major boxing event here in the United States, it is certainly a major event in China and possibly many other Asian nations. For that very reason alone, we boxing fans should tune in and support this event. If Shiming can knock his opponent out, should his level of competition be raised for his next bout? Or should they continue to build him up slowly? Please comment below. We value your comments and we thank you for supporting our site.